We arrived in Phoenix yesterday evening and were welcomed by the cool evening dessert air and mountains surrounding the valley where Phoenix resides. What a welcome sight! 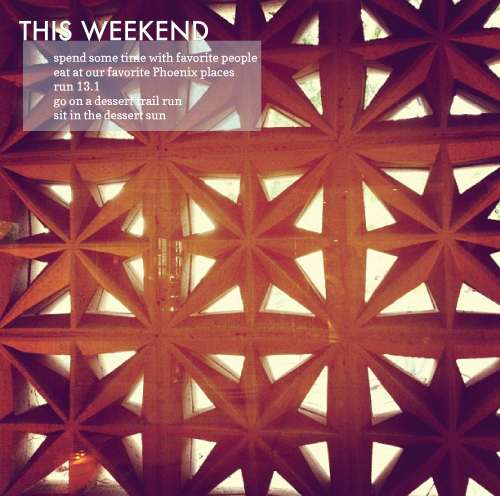 Our weekend here looks much like our typical weekend when we visit Phoenix: we will be spending time with our favorite people and eating at our favorite restaurants. We get to see two of our favorite people from Durango, as well. We have the Arizona Rock'n'Roll half marathon on Sunday, but while we are here I also want to get a trail run in, probably just at Papago Park. I love winter in the dessert!